Winter Equinox - "Safe and Sound"
Safe and Sound is the debut full-length CD from Winter Equinox, and what a debut it is! A swirling blend of rhythmic and percussive pulsations, noise rock, and chamber pop, it strikes a perfect balance between post rock minimalism and prog rock complexity. The opening track, Two Eyes, ably demonstrates the quartet's amazing ability to combine all of these elements into one focussed piece of music as the rhythm section of Brad Weber on drums and percussion and Dan Roberts on bass create a hypnotic back drop for the lushly beautiful melodic textures that Lauren Yakiwchuk and Robyn Yakiwchuk both provide on dual keyboards, fuzzed out guitar (played by Lauren) and especially on their lovely blend of clarinet and flute. Listen as well to Seeing Stars to hear how the band skilfully weaves numerous warm and inviting melodic lines through the gently flowing rhythms. The band members are all classically trained musicians, and you can hear that, especially in tracks like It's Always Nighttime Somewhere, which presents a dark, wintry and almost cinematic soundscape of chilling beauty. On Scenic Caves, they balance hyper paced jazzy rhythms with both creepy atmospherics and a sort of psychedelic jazz to great effect, but also they also let the piece drift into a haunting middle section, which takes on a moody film soundtrack feel. The band comes up with endlessly inventive rhythms. On Shiny New Penny, for example, we hear a punchy robotic-style programmed rhythm that still manages to be warm, vibrant and playful, with a dash of tension thrown in by the bass line while atmospheric sounds swirl beneath it all. Eventually the rhythm dissolves into a spacey and shimmering swell that almost reaches orchestral heights. Safe and Sound, in fact, strikes me as a bit of a misnomer, because Winter Equinox never plays it safe and sound, delighting in travelling out onto precarious musical branches, searching for new sonic territory to explore. And on this album, they find it. 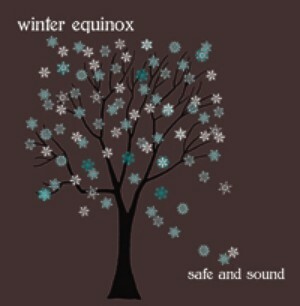 For more information, visit Winter Equinox at their web site: http://www.winterequinox.com. Or the Crony Records web site at: http://www.cronyrecords.ca.